Hannibal Boxing is a media company that, like its namesake, combines the elements of art and war that make boxing the enduring sport that it is, and brings smart, bold content to its readers. Hannibal has been an emerging source for incisive analysis of the sport, while at the same time using its online platform to celebrate the history, artistry, and culture of the sweet science. Founded by Kyle Sarofeen (formerly of Houghton Mifflin Harcourt, Quarto, and Pearson), and Andy Komack (formerly of DraftKings), Hannibal Boxing Media is headquartered in Boston. 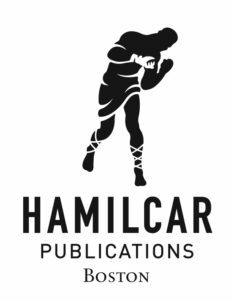 Supported by a dedicated, engaged, and loyal community of boxing fans, Hannibal Boxing will officially launch, in Fall 2018, Hamilcar Publications—a book publishing imprint that provides a first-class home for authors and offers the finest boxing books available. The boutique publishing company will target an underserved niche in the book industry—readers devoted to the world of professional prizefighting. The highly anticipated new edition of legendary seventies heavyweight Ron Lyle’s biography, OFF THE ROPES: THE RON LYLE STORY, by the late Candace Toft [October 2018]. Features a foreword by broadcaster and International Boxing Hall of Fame member, Al Bernstein. JACOBS BEACH: THE MOB, THE GARDEN & THE GOLDEN AGE OF BOXING by Guardian writer Kevin Mitchell [November 2018], a fascinating, noirish look at boxing and its underbelly in New York in the 1940s and 1950s. 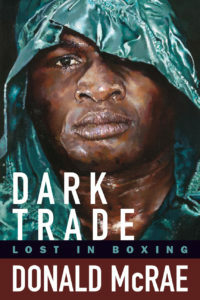 A new edition, released in the United States for the first time, of one of the best boxing books of all time, DARK TRADE: LOST IN BOXING, by Donald McRae, also of the Guardian. [November 2018]. Includes a new chapter by the author plus a stunning cover that features a painting of boxer James Toney by noted boxing artist Amanda Kelley. A new collection of essays by award-winning boxing writer and HBO contributor Carlos Acevedo: SPORTING BLOOD [January 2019], With a foreword by Thomas Hauser, Pulitzer Prize and National Book Award nominee, who is widely recognized as one of the world’s preeminent boxing authors. Hauser has won the prestigious Prix Lafayette, the Nat Fleischer Award for Career Excellence in Boxing Journalism, and the Haviva Reik Award. Showcasing books on uncommon subjects that will fascinate knowledgeable boxing fans as well as lovers of biography, history, and true crime, the inaugural list will appeal to a variety of readers. With award-winning cover designer Brad Norr on board and a focus on interior design and editorial detail, consumers should expect books of the highest quality from Hamilcar. Kyle Sarofeen, Publisher and Principal. Kyle has worked in the book publishing industry in the Boston area for over fifteen years for companies such as Houghton Mifflin Harcourt, Quarto, and Pearson. His background is mainly in interior production and book manufacturing. At Houghton Mifflin Harcourt he was the lead buyer for the Curious George series, and at Quarto he was in charge of manufacturing for two imprints. He also did a stint in Pearson’s marketing department. Other highlights include being selected as a jury member for the New England Book Show, and doing an editorial internship with the prestigious boutique publisher Shambhala Publications, which is where his career started. His passion for boxing started when he watched Marvin Hagler fights as a teenager growing up in Massachusetts in the eighties. In addition to his experience in the book business, he has an MBA from the University of Massachusetts Lowell. Andy Komack, Principal. Andy has spent the past twenty years helping entrepreneurial companies with their digital marketing strategies and strategic partnership development. He founded and ran a digital marketing agency, which he sold to his partner in 2007 (www.komarketing.com). After the sale of the agency, Andy worked with some of the most entrepreneurial companies in the Boston area, including DraftKings, where he created dozens of partnerships with some of the most-recognized teams in sports well as other sports marketing partnerships that added value to DraftKings’ unique brand of fantasy sports gaming. He has an MBA from Babson College, the number-one school in the United States for entrepreneurial studies. At Hannibal Boxing, our aim is to continue in his tradition by bringing content that is bold and smart to those who appreciate those qualities in the sport of boxing. Hannibal Boxing Media, LLC, also owns and operates Hamilcar Publications, the book publishing arm of Hannibal Boxing. Find them on Twitter @hannibalbox, Facebook @hannibalboxing, Instagram @hannibalboxing, and on LinkedIn. A portion of the proceeds from Hamilcar Publications titles will support Ring 10, a charity that helps retired boxers who are in need.